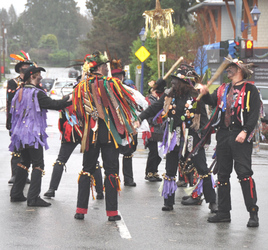 From the exuberantly druidic steps of Morris dancing to show tunes and children's choirs, the Dundarave Festival of Lights lets the best spirit of our community blaze out in the darkest time of the year. It gathers us together as neighbours and friends in the pure joy of music. Here's to everyone who helps make the Festival shine, with $50,000 over two Christmases for the Lookout Shelter. Because one miracle deserves another, this Christmas will see the rebirth of the Dundarave Nativity. At least 65,000 people walk and dance, sing and play in the spectacular forest of Christmas trees on Dundarave Beach through the holiday season. Here's a taste of what they see, and why they keep coming back. 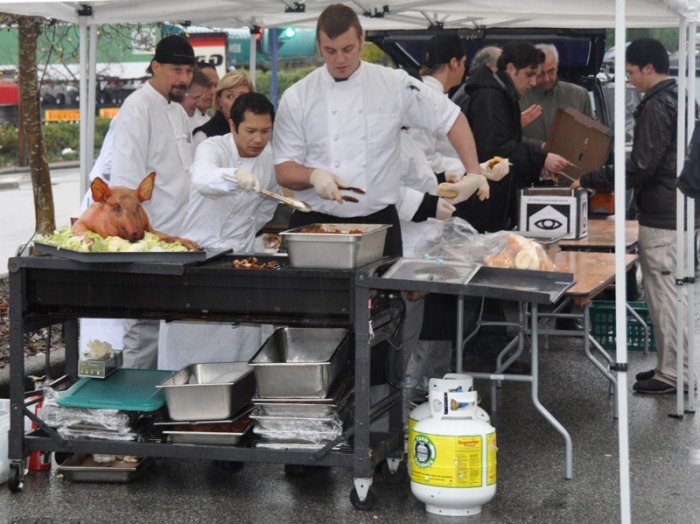 The Dundarave Festival of Lights, with the support of trailblazing Festival Founders Penfolds Roofing, Tim Lack & La Van Lack Atmore Law, Great Canadian Landscaping and the Vicic family, brought a taste of its coming season to West Vancouver's Community Day. The Festival's presence allowed a glimpse of Master Carver Bill Seminoff's expansion of the Dundarave Nativity, and it gave kids a chance to sharpen up their Christmas tree ornament making skills. The Christmas spirit on the North Shore is not for the faint of heart. As the rains continued to gather to a river swelling greatness, we gathered at Dundarave Beach on the longest -- and wettest -- night of the year to light up the bonfire, set up the stage and Heaven's Kitchen. The rain stopped. Hundreds of people filtered through the two hours of the event, many of them saying no storm could keep them away. 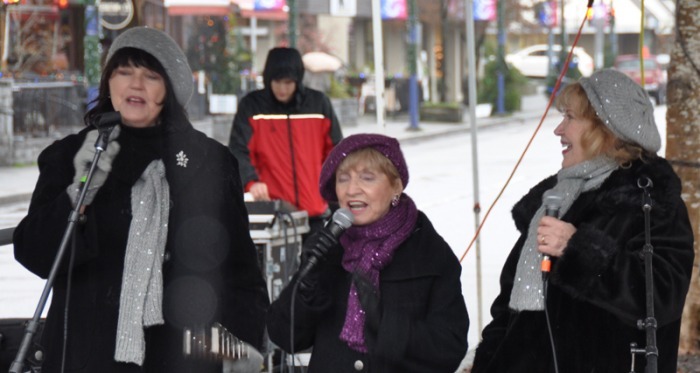 They ate Chef Don's amazing burgers, danced with Tiddley Cove Morris, the Hot Mammas -- they were in fact red hot -- and warded off the chill with the West Vancouver Adult Pops Band. Together we've raised $25,000 and counting for the Lookout Emergency Aid Society's North Shore Shelter, with the West Vancouver Firefighters' Benevolent Society doing some heavy lifting to get us over the top with their donation of $2,000. To make a donation of your own to the Shelter before the end of the calendar year, contact us at festivaloflights@shaw.ca and we'll make magic happen. Many thanks to the District of West Vancouver for partnering with the Dundarave Festival of Lights Society to make the Yuletide Bonfire a festive and fierce light. Congratulations to École Pauline Johnson, winner of the people's choice for the Best Tree of 2009! Come rain or starry skies, Dundarave Beach shines like no other place this Sunday on the longest night of the year. 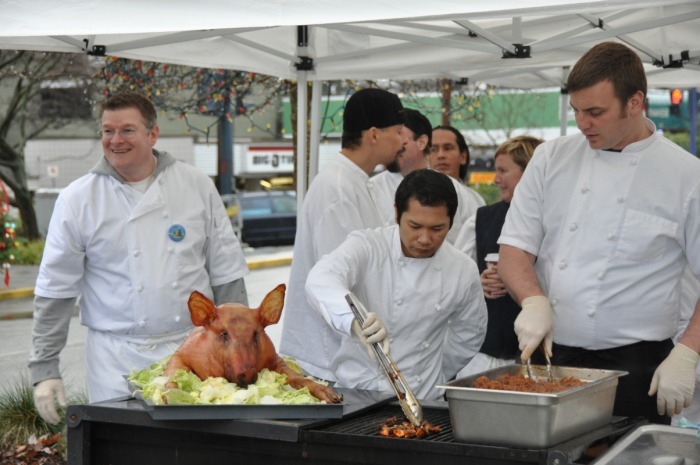 In partnership with the District of West Vancouver, the Festival brings a twenty metre bonfire on the sand, against the spectacular backdrop of a forest of shining Christmas trees. Bring your family and friends to warm up the night with free live performances from the West Vancouver Adult Pops Band, PNE headliners the Hot Mammas, and the fresh vibes of Double Helix. 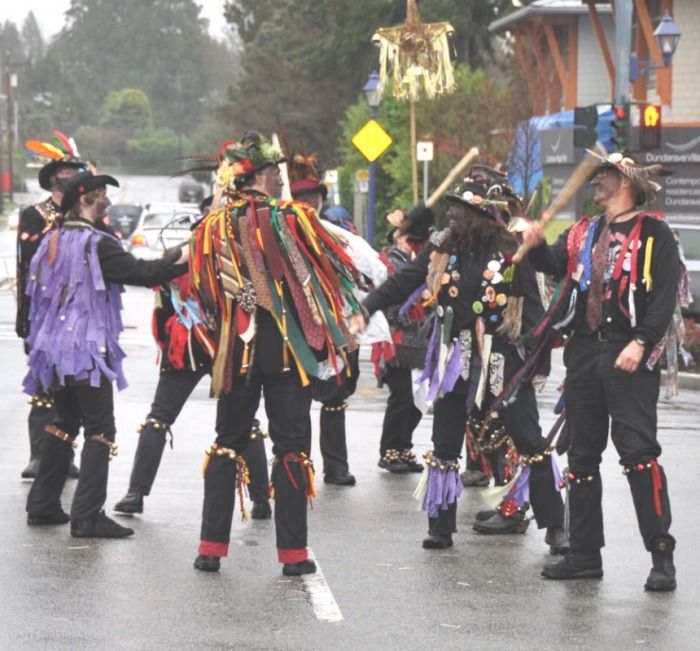 Back by popular demand, Tiddley Cove Morris and the Black Sheep Morris Men of Bowen Island will charm this solstice night and point our way to Christmas. 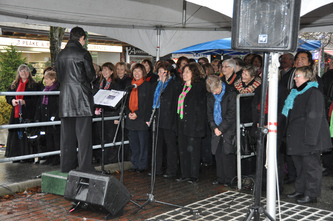 Carol ships will sail past at approximately 7:45 and 8:15 pm, so bring your best caroling voice to guide them in. The Yuletide Bonfire marks the Festival's biggest fund and awareness raising event to end homelessness on the North Shore. There's no better way to keep the true spirit of the season than to make sure no one is left out in the cold. Staff from the North Shore Shelter will be present to show how we can end homelessness together. Please come ready to make a tax deductible, year end donation to support the Shelter's work. Heaven's Kitchen on Dundarave Beach Chef Don Guthro and his trainees in the North Shore Culinary Program will serve up what may well be Metro Vancouver's best burgers at the Yuletide Bonfire from 7 pm to 9 pm. This movable feast will allow you to taste the difference hope and determination make at Christmas, as residents of the Shelter claim their places in our community in Heaven's Kitchen. Congratulations to the West Vancouver Secondary School International Baccalaureate Programme for their brilliant donation of $500 to the North Shore Shelter. Come hungry, everyone. The Dundarave Festival of Lights has everything your family and friends need to live out loud this Christmas. Here are some highlights of our Festival season. Be sure to check the Festival's Event Calendar for the big picture. 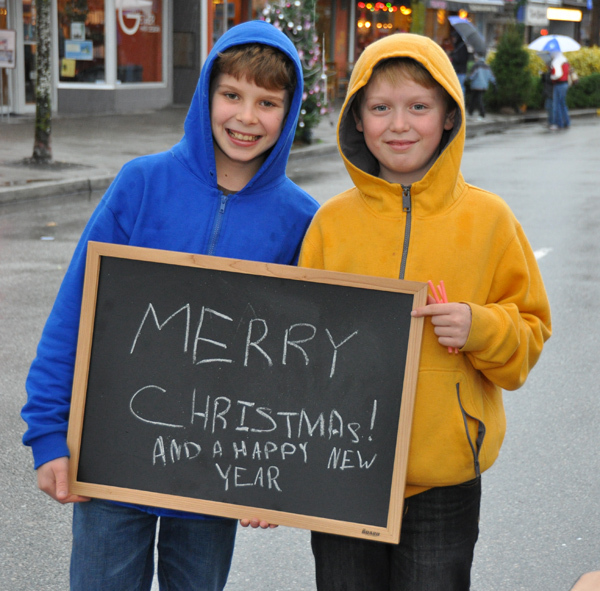 Dundarave Christmas Fair, Saturday November 28th 1:00 pm to 5:00 pm Join the West Vancouver Youth Band and a host of other performers for what may well be the world's largest outdoor Christmas tree decorating party. 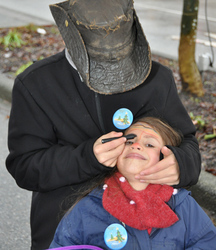 Dundarave Village and Dundarave Beach open the holidays with Christmas on an olympic scale featuring Chef Don Guthro's fresh air barbeque, crafts and games for kids provided by Santa himself, a craft market, and -- because Christmas wouldn't be epic without them -- an army of fiercely festive Morris dancers. Join us for the countdown at dusk when we officially light up the trees. 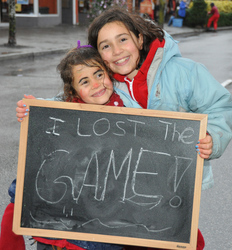 To keep kids safe at the heart of the Dundarave Christmas Fair, Dundarave Village will be closed to vehicle traffic. 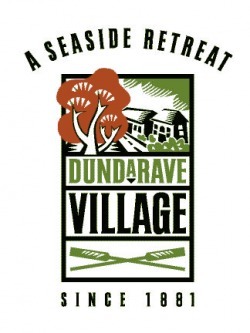 The Dundarave Nativity, Saturday December 5th 11:00 am to 3:00 pm Head down to Dundarave Beach for music and a chance to meet master carver Bill Seminoff. Through months of painstaking work, Bill rescued and restored the life size carvings of the Dundarave Nativity. The origin of these figures depicting the story of the First Christmas remains a mystery, even though they've been on display at Dundarave Beach every holiday season for decades. Carved of old growth cedar by an Aboriginal artist, the Dundarave Nativity is a powerful testimony to the rich cultural heritage of our community. 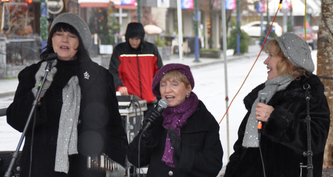 Music in Dundarave Village, Saturday December 12th 11:00 am to 3:00 pm Dundarave Village stays bright with the sounds of Christmas, with live music in the intimate performance spaces of Dundarave's shops, restaurants and coffee houses. Yuletide Bonfire, Sunday December 20th 7:00 pm to 9:00 pm Warm up the longest night of the year with family and friends as we gather again at Dundarave Beach around a 20 metre bonfire. This night will be rich with great music and food to keep the chill away. The passage of Carol Ships on this night, the embrace of our forest of festive trees and the torrent of sparks rising from the bonfire will help bring the best spirit of the season home to you and the people you love. 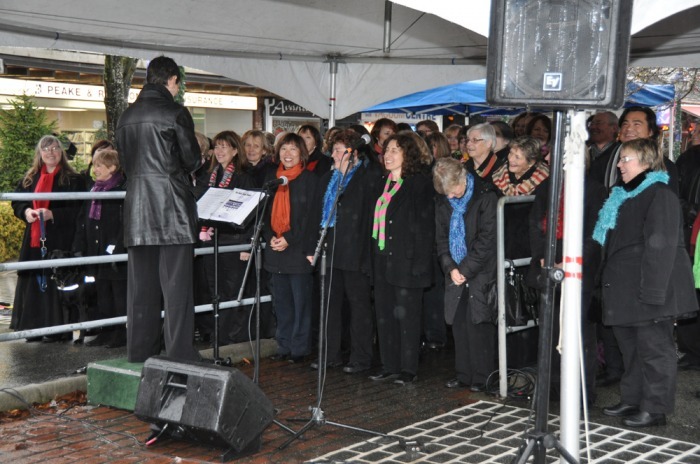 West Vancouver's luminous celebration of the true spirit of the season returns for its 18th year. The Dundarave Festival of Lights brings the light and life of Christmas to the heart of our community, lighting up Dundarave Village and Dundarave Beach with a forest of festive trees. For the first time in its history, the Festival last year raised $25,000 to combat homelessness on the North Shore through the generous support of families, community groups and businesses like yours. Nothing keeps the season, as Scrooge himself discovered, like feeding the hungry and housing the homeless. This Christmas, there's glory and joy enough for all as we gear up to beat this record. It has never been easier to participate as a tree sponsor. Two quick steps will get you there. 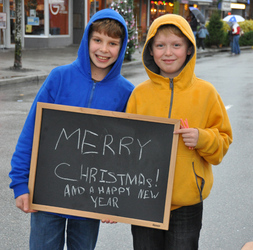 First, sign up with a festival fee of $100 per tree payable to the Dundarave Festival of Lights. Second, make a charitable gift to the Lookout Emergency Aid Society-North Shore Shelter as a Bronze ($250 - $499), Silver ($500 - $749), Gold ($750 - $999) or Diamond ($1,000+) donor. You will receive a charitable tax receipt from the Shelter and recognition of your level of sponsorship at the Festival. 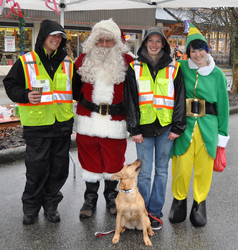 West Vancouver's Firefighters made Festival history last Christmas for the largest single donation to the Shelter, setting a very festive $3,000 as the number to beat this year for Diamond sponsors. Through the generous support of tree sponsors, the Festival's record breaking donations helped the North Shore Shelter create its North Shore Culinary Training Program. Under Chef Don Guthro, this innovative professional kitchen and restaurant training program gives essential life and employment skills to some of the most vulnerable members of our community. Your donation through the Dundarave Festival of Lights will keep Christmas bright all year, by making sure the Shelter's kitchen remains a life changing, soul nourishing place. To reserve your tree and make this Christmas bright, email us at festivaloflights@shaw.ca, or use the form below. Be sure to confirm your level of sponsorship -- bronze, silver, gold or diamond. Congratulations to the 2008 Christmas festival champions, North Shore Dragon Busters! "The icing on the Christmas cake, however, was winning first prize for our decorated tree at the Dundarave Festival of Lights." We will not share your name or email address with or sell them to anyone else without your consent. We will use the information you give us only for the purposes of organizing an amazing Dundarave Festival of Lights.